This is a stunning Fukuro Obi in a gorgeous raspberry/burgundy shade of Silk that is highlighted on sixty percent of the Obi with an intricate pattern on pattern gold metallic design. 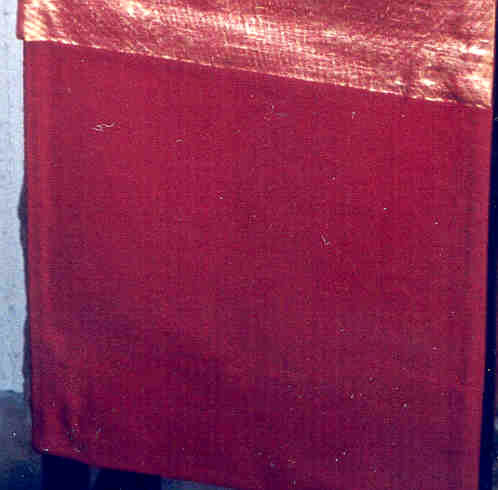 An Obi of this type is called a “Rokutsu” Obi and lends itself to numerous dramatic uses. 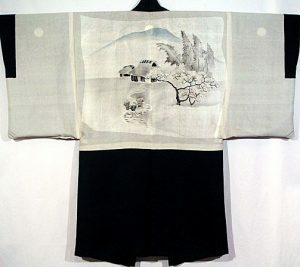 Fukuro means “pocket,” but is used to refer to the fact that this type of Obi is made of two pieces of material, sewn together on the outside edges. This style of Obi enjoys great practical use today as it is the same length as the Maru Obi, but slightly narrower (perhaps by 3/4ths of an inch); and, therefore, much less bulky. 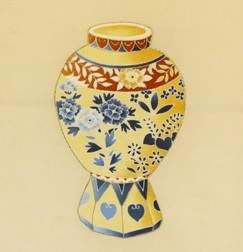 It alternates patterned and plain Silk weaves. 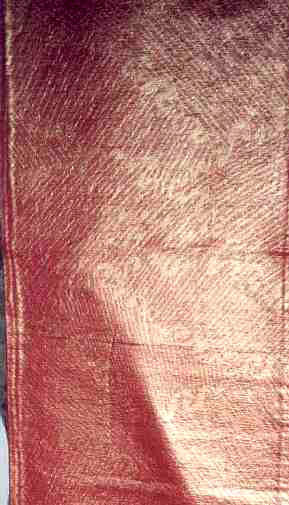 The gold patterning consists of diagonal stripes overlaying the plain burgundy Silk that intersect each other in blocks of differing directions. 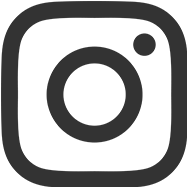 Each striped block is further outlined by a flowing “S” type scroll line. 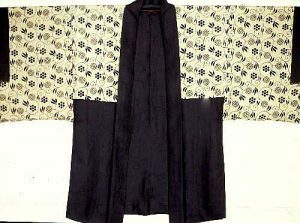 A Fukuro Obi is generally patterned on one side and is usually worn for formal or informal occasions. 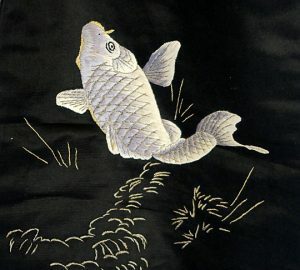 Silk Fukuro Obi with massive amounts of pure gold thread brocade.